Masks in the Tibetan Buddhist tradition are used as a means to transform identity -just as in many other cultures all over the world. 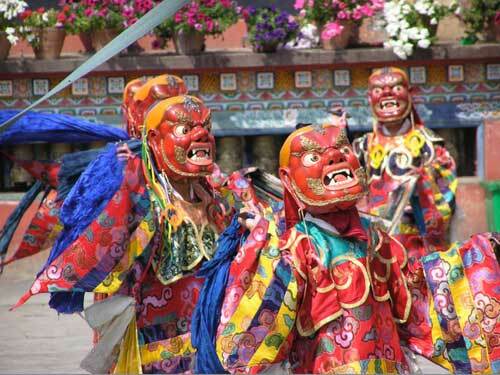 In this tradition, a form of masked, sacred monastic dance was developed (called Cham lama dance). Often performed in the central courtyard of a monastery, the Cham is danced by monks and nuns, on the rhythm of bone trumpets, horns from copper, cymbals, and chants. 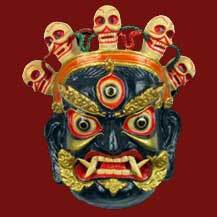 The masked actors represent past Buddhist teachers & saints, wrathful deities, animal deities such as the deer, demons, skeletons, and other characters. They whirl around in an allegorical dance about the victory of Buddhism over the negative powers and demons. 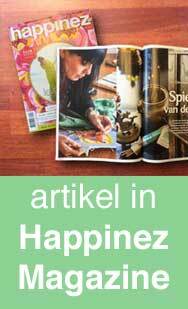 The pictures below are that of the Tibetan mask making workshops that Carmen Mensink gave at the Rubin Museum of Art in New York City. These workshops were connected to the Rubin Museum of Art’s 2015/2016 exhibition ‘Becoming Another’, which shows both the common threads and the distinct differences in mask traditions from many cultures such as Tibet, Nepal, Northern India, Bhutan, Mongolia, Siberia, Japan, and the NW-Coast tribes of America. Masks are used in communal rituals, shamanistic practices as well as theatrical performances. It’s all about transforming one’s identity. Carmen took her students of the Tibetan Mask making workshop first to the galleries where she led them around and explained about the different masks in the exhibition. Next, the students stayed in the galleries to draw sketches of the masks that appealed to them the most, and after that we started drawing & painting the masks. 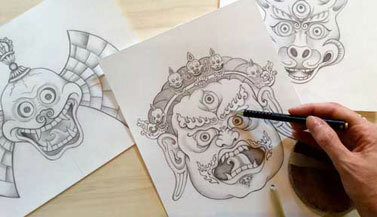 If you want to learn how to create a Tibetan mask (2 or 3 dimensional), check out the Tibetan Art Classes.